Photograph taken at outdoor function, see also items 2009.6.1.629 - 2009.6.1.634. Handwritten annotation on verso reads: “model ships in G.H. Pool to honour BC Based H.M.C.S. 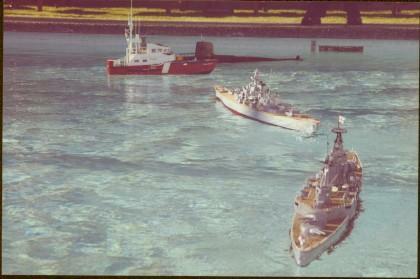 (Esquimalt) + Admirals”. Item is part of The Honourable Iona Campagnolo fonds.